for me, the image is just another snapshot, not story telling due to the fact the womans back side is uninteresting. Sorry to say you missed the mark this time. The use of red means she is immediately the subject, despite the visual competition of the laundry. I’m not saying you have to like it, nor am I seeking to defend it, but those were the visiual aspects that drew me to the scene. I did debate trying to get her attention, but often when a street subject is looking right at the camera it loses a lot of its street appeal, especially if the look you’re getting isn’t favourabke (plus you’ve influenced the scene) so I decided to take it as I found it. 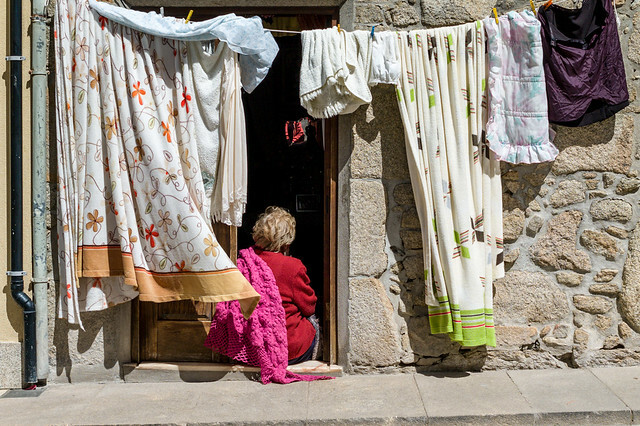 Strong colours, a natural frame within a frame combined with the slightly odd notion of drying your clothes in a public street, whilst sitting with your door open staring into your own house. Possibly not my finest hour, but worth pressing the shutter on. Nice composition enhanced by the black drainpipe on the left balancing the black cloth on the upper right and the red “spot” above the woman balancing her red dress. Now why isn’t she enjoying the sun? Or that “spot”, is she watching TV? A bit of an enigma that gives extra interest to the photo! I think the photo is all the better for not showing what she is watching. And (of course) the colours pull the eyes into the photo.